Hey Sinwrath, we totally feel like you do in terms of how much we need to (and want to) update our old champs. The potential of these characters to be awesome is really high. Just in terms of designers on the champion update team, this year we are growing from 4 to 6, and at the same time I think (hope) we’re getting better at what we do. We don’t have any set timelines like “expect 1 update a patch,” but we will release as many high quality updates as we can this year (both big and small). We are in progress on a bunch of the champs you have listed above, and the work is looking very promising so far. That said, we don’t have any plans to slow down new champion releases. IMO new champs are part of the lifeblood of what keeps League fresh and evolving. 2015 is gonna be a good one. Â We actually work very closely with a lot of people, so every update gets feedback and improvements from 10-20 different designers and another 20 artists, producers and engineers. The whole champion update team is closer to 30 people, in 2014 we had 4 game designers (not including me). Some are small, medium, and some are big scope. Also there are a bunch more in the pipe just not ready to talk about yet. This time around, Taric’s update is not going to be a small one. The next update you guys see to him will be pretty substantial. Haven’t locked down full details yet so we haven’t established a release patch yet (and don’t have too much to share as far as details go), but he’s one of two projects I’m pretty actively working on. We’re actually working on GP as well, he’s just a bit earlier in the process. Agree that Shen needs work, we just have so many to do and only enough bandwidth for a handful at one time. We will get to everyone that needs it in time. It’s definitely true that there is a point (just for illustration say 500 champions) where there are more champions than there should be and it starts to detract rather than add value to the game. At our current rate of ~8 new champs a year, I think we have at least a few more years before we start to hit the point of slowing down further. On point though, we definitely want to ramp up the rate of fixing/improving existing champs by a large amount. The main ideal impact is more teams can split push even if it costs an item investment to do so. Or a different type of siege pressure. The item actually functions best when there is someone present to support it. It’s kind of weak at pushing minions itself (intentionally). It WILL eventually push down a tower, but it takes awhile by itself. The type of opening that provides though could be useful. Nasus CAN gain stacks on it. Be careful when building against Nasus. And yes, the item does have uses outside of split pushing. It can compliment a siege. It can be placed preemptively against a lane that is at risk of slowly pushing towards a tower alone to help negate it. It can be used for vision (in kind of a weird manner). One of the core concepts to the item is “here is a defensible point you must take from me”. It’s a tool to lure your opponent into engaging or making a mistake. Making it hittable by skillshots goes against that. Most ranged champions have better tools available to them for taking towers than Zz’Rot Portal already. 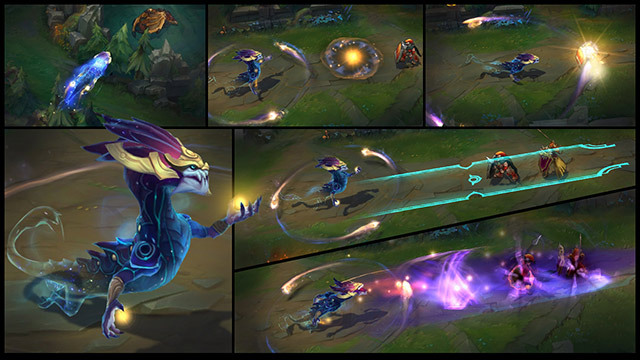 If it becomes a must pick on all champions, then the base stats of the voidspawn can be dropped even further and more of it shifted over to how your defenses contribute to its damage. That is, pushing it even further into the realms “tank only-ness”. Damage output counters Zz’Rot Portal innately in that you can clear the voidspawn and the void gates. If your opposing ranged character purchases an early Zz’Rot Portal, then you can build clear and sustain (Tiamat) to deal with it or you can threaten pressure elsewhere. By putting their value into pushing power, they sacrificed stats that could’ve helped them with Dragon. The cost of the item is already paid by building it. Unlike a champion ability, there was already significant investment given to getting a void gate out. Turning such an investment into a reward for your opponent is… tricky and not ideal. The void gate itself does provide 25 gold when you kill it, but even that is only a tiny bit for the purposes of the incentive, “this is the thing you’re supposed to kill”. My predictions: It will have a spike in usage when it first rolls out then it will have a drastic decrease. People will find creative usages and some people will become attached to it. It’s a uniquely fun ability – active map presence on an item – for some players. I don’t think it will have an overwhelming usage rate though, it’s not really “core” on many champions. They currently aren’t boosted by siege commander. That will probably change. Top, Bruisers, or a late game “My GA is on cooldown and I just really need to take a turret so I’ll exchange the GA for this new thing” item. Fun fact: Raptor Cloak (and thus Point Runner) was made for this item. It building into Ohmwrecker was a later changed. This item just got delayed enough that it got released in a weird order. Currently, no. It was tuned for SR lane distances so we would need to do a bit of research to make sure it would work healthily on those maps first. Nope. Sorry! It could be kind of interesting on Crystal Scar, though the cooldown might be a bit long for the map. Hm. Â [ Context ] Sona’s base MS was recently decreased from 330 to 325 on the PBE. I can definitely appreciate the perspective that she isn’t really crowding out support selection diversity. That said, we want to stay on top of the successes and shortcomings of all of our champion reworks, and we feel that some of Sona’s gameplay patterns are not the most healthy experience for bot lane. Fighting Sona has a lot of strategic depth that you talk about (pick hard engage or burst characters like Leona to fight her), but we want counterplay to extend past champion select and still be relevant tactically (in lane). The MS change is intended to give enemies without extremely strong engagement capabilities a fair shot at fighting Sona, without exaggerating her weaknesses to hard engage that something like a base HP/armor adjustment would do. Understandably, Sona isn’t perceived as particularly strong, given that she isn’t being picked every game (especially in competitive play), and does not seem like she is taking over games that she is in. That said, we have a lot of tools and data we use for examining the game, and in addition to some of the play pattern issues I mentioned, we do feel that she is on the strong side for supports for a wide range of ELOs. Keep in mind, this is intended to be a pretty small nerf overall. Now let’s talk about a few of the other issues you mentioned. 1) Jungle diversity is an issue we agree we can help improve. Next patch you’ll see some movement towards what you’re talking about (for instance, Hecarim and Skarner are getting a little love). 2) There are some counterplay issues with a few assassins in our game. These problems are pretty complex ones to solve, and some of the champions you mention definitely need some changes to stay healthy (I think Zed is probably at the top of that list right now). 3) Top lane is a much bigger issue. There are so many factors involved here (power of Teleport, relevance of Dragon, power of Marksmen vs Fighters, etc.) that this is a larger scope problem that would take multiple patches to work on. But you definitely make a great point, there are some issues in champion diversity top lane and we need to do some work on that. The changes we’re putting in this PBE cycle for Sona will be going out with the next patch, but hearing opinions from Sona players and seeing this discussion is very valuable for us in the future if we need to reexamine the state she’s in. The feedback regarding how players feel that so much of her power is weighted in her Q is useful. Also agreed regarding Q Power Chord pushing out other choices (this is part of what the changes are supposed to address, but we may need more work here). I also want to thank everyone for contributing your view in this thread (particularly the constructive posts…); improving communication with our players is something I always want to be working on. It’s definitely an odd space. You could certainly force a wider variety. You could say “Okay, you can only play each champion once per month / once per series / if your opponents haven’t played it either.” Enforcing a wider variety of champions can be interesting because you’ll see more of them played. You could have 20 bans. You’ll definitely see different stuff played if you do that. Another question can be if just “Champion named Ezreal was picked” counts as one unique pick. What about Mid Ezreal vs. ADC Ezreal? What about Support Nautilus vs. Jungle? Kayle Top/Mid/Support? How about different builds? AP Amumu vs. Tank Amumu? You can track the specifics of “Champion named X was picked.” Does that tell the whole story? Do you care if they were built differently? AP Mid vs. AD Bot Kog’Maw? I’d argue this counts as a “different” pick, but it’s of course not tracked as that. Certainly, an edge case, but it’s food for thought. On that line of reasoning, I think 2014 was a year full of flex picks. We saw Karma, Lulu, and a whole host of other mages go in various lanes. Would a better line of reasoning be, “How many Supports did we see this year? How many Mid Laners did we see this year?” Double-counting Jayce doesn’t make for a very interesting comparison, but Annie might count. I think we saw more flex picks in 2014 than any other year. There were probably at least two dozen champions that were played in more than one role this year in professional play. The game has also become more homogenized. Up until halfway through Season One, many teams weren’t running ADC+Support bottom lanes. Now it’s considered commonplace. Not everyone knew Kassadin was crazy strong throughout 2013, Cloud9 least of which, but he defined the first half of 2014’s Ban phase. Nowadays everyone’s watching the Koreans and saying, “Ah, LeBlanc and Corki are contested. We should all learn them.” The fact that all the top-tier players have a standard to look to and compel themselves to emulate shrinks our champion pools significantly. I specifically asked Cloud9’s Hai about this at the beginning of 2014. He said they sat down, had a meeting, and told me (paraphrased), “We chose to drop our old playstyle. We should play like SKT. They won the world championship. Let’s be like them” Well, SKT couldn’t even qualify for Worlds the next year. I’m not certain that emulating a specific team or style of play in a constantly-evolving game is the right way to thrive. Cloud9 had, consecutively, their worst splits ever after making the decision, “Let’s copy SKT.” Throughout 2013 they made their own rules. Meteos made his own jungle style. Sneaky and LemonNation pulled in their own champion pools and style (Hello, Ashe/Zyra). Certainly, other factors than just “not innovating” led to teams taking more games off C9 than before; I’m just bringing up trends I see. In my opinion, almost every single champion in League of Legends can be that champion. The next Rengar is out there. The next Support Annie or Support Morgana is out there. People just arbitrarily started playing them and everyone decided it was a good idea. But people seem to glom onto them really, really hard, so the pools decrease. What’s the way to fix that? Is it OK to “force open” the champion pools? Should we just track “# of Supports played” across seasons and trend that? What should change? Ryze, Warwick (except ultimate), Orianna, Jinx, Morgana… The list goes on pretty much the entire way. Very few champions have no mobility abilities, so it’s easy to say, “Well, mobility wins.” Except that Looper showed us both Singed and Kayle as completely dominant champions. Talon can only jump to enemies, and crushed people. Jayce likewise, same impact. So, I have to reiterate, that saying things like “Cut in half” is very odd when there is I think literally one melee champion without some way of moving faster in Mordekaiser, and then some other fraction only has movement speed buffs… Yet we saw Dr. Mundo played for most of the split. And again, as far as ranged champions go, I think literally every conventional Support doesn’t contain tactical mobility skills. Twitch was arguably the defining ADC of the World Championship. Orianna hasn’t gone anywhere in literally ever, and neither has Rumble. Now you can make the point that champions can be come non-viable, but mobility is an absolute red herring. That’s not quite correct, though I understand where you’re coming from. We are not, as a game, against a champion being viable in multiple roles. We’re fine with Lulu working in 4 roles right now. We’re fine with Karma working in the same ones. We’re fine with Hecarim as a jungler as well as a Mid Laner (and I’m sure he’s fine Top also). The changes to champions when they worked in certain lanes came from the gameplay impact of that lane. When Janna walked into lane, Pressed Q in the vague direction of the minions, and then immediately last hit the entire wave, that was an issue. When Lulu clicked “E” and then pressed “Q” twice, causing you to lose 50% of your health without it honestly being a real skill shot, that was the issue. When Annie’s low level base damages and stun were so obnoxiously high you immediately lost any possible 2v2 fight bottom lane, that was the issue. Notice how literally nothing changed about Karma after we saw Bjergsen get a pentakill on her in the LCS playoffs, despite being played as a support the week before. Lulu hasn’t been changed in about 4 months (E duration on enemies being the big change) after her mid lane pattern became significantly less toxic. There’s a bunch more void things in the game, but the Voidspawn ignore them for other reasons already such as various champions (Rek’Sai, Kha’zix) or Baron. These creatures (Voidspawn at least) has no reason or natural behavior to attacking other void things. This may be a normal void behavior – at least for the more “basic” void creatures – but there’s been no other real cases where we’ve gotten to see what the unchained whims of a void creature has been. The Voidlings you see in game are mostly under the control of Malzahar and thus could be directed against what is natural for them. Voidspawn, unlike voidlings, aren’t “directed”. They have a sense of team apparently, but beyond that you have no way of really directing them. Their behaviors are very simple. This is probably due to opening a portal for them to come through is suitably different than calling for their service. It might also explain their volatility. Of course the real reason for them ignoring void targets is that, gameplay wise, it was kind of boring to cancel a void gate with another void gate since it just meant inaction for both sides. Making them ignore all void targets was a “clean” way of solving that issue and allowed for a cute “also ignores voidlings” secret behavior. This is correct! The E is a new spell although it has similarities to the feeling of the previous one (it’s still a targeted spell, still has the passive AoE on minion kill). The rest of her kit is basically just numbers tuning, and the W will have an interaction with the new E.
Yes. I have adjusted the AP ratios to be a bit healthier (less free burst for just clicking R) but her overall burst power will still be the same if you use the new E correctly. There will be more emphasis on her jumping in to do her combo instead of just click E click R though. TLDR: When assigning soldiers positions for Conquering Sands (Q), Azir would historically grab all soldiers on the map in random order (most often this would happen to be in order of creation, but not always). As demonstrated in the video, in the three soldier case this sometimes leads to an unfortunate situation where the nearest soldier is assigned one of the side positions, 240 units off your mouse cursor. I took some time tonight to rewrite how Q works and cleaned up some bugs surrounding the 2/4 soldier cases as well (4 soldiers is technically possible, but very, very rare). Here’s the breakdown, with pictures! Pretty straightforward. Goes where you click. Your click position is a 75 radius green circle, the calculated soldier position is a 100 radius red circle. In this case they’re identical. The soldiers align themselves around your target position, equidistant to the left and right of it. 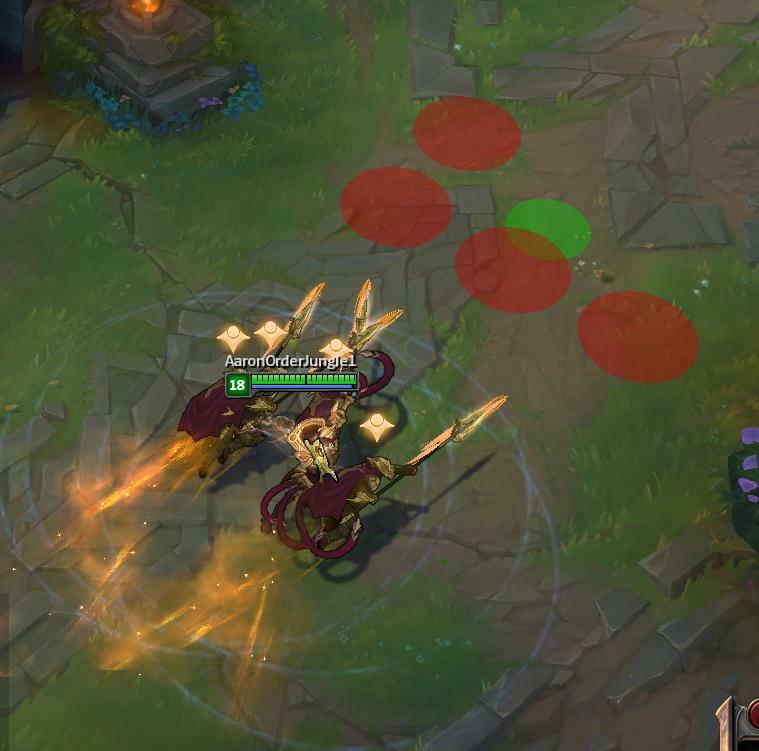 The nearest soldier always goes to the left position, viewed from Azir’s perspective along the axis of your cast direction. This is the situation from Unknown Martian’s video. I fixed this so the nearest soldier will always go to the MIDDLE, which is the position that you clicked on. The second closest will go to the left and the farthest will go to the right. This is very rare and hard to achieve. Hint: both Q and AA extend soldier lifetime by a fractional amount in certain situations. Not something I expect players will be able to exploit in real games, but just in case. As you can see, the first row of soldiers places itself slightly nearer to you than where you clicked, with the nearest soldier going to the center. This is only a difference of 120 units, and Q overshoots by 50 units, so this difference shouldn’t make you miss (we do check forward an additional 100 units at the end of a Q to see if we can find someone to hit anyway, so it’s a moot point). None of this has been QA checked yet so details may change or the rollout of these changes may be delayed. They will also not be in the next patch; at the earliest, they will be in the patch after that.